It makes sense if you want to make shopping for your dorm room essentials as easy as possible, and we want to help you with that! You have a lot to do to get ready for college and at DormCo we want to at least help you get the proper dorm equipment ready to send you on your way. To make college supply buying easier, we offer amazing Full sheet sets that will help you get a headstart on your college bedding. Unique Full sheet sets like our Bare Bottom® Sheets - All Season - Full Bedding - Black come with a Full fitted sheet, a flat oversized Full sheet, and (2) matching pillowcases. This stylish and insanely comfortable Full sheet set let's you fully cover your Full mattress and standard dorm pillows with the same incredible look and feel. Our Bare Bottom® Full sheets are made with an extraordinary microfiber that is unlike any college bedding you've ever felt before. You'll absolutely love feeling this amazing silky smooth soft comfort all over your Full bed. The color of these Full sheets are also appealing for your college dorm room. 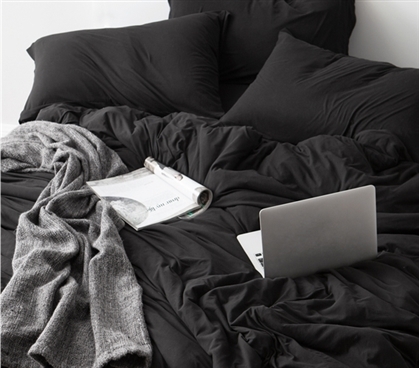 Black Full bedding will help you blend your Full sized dorm bed with the rest of your college decor, giving your dorm room a spectacular look. These one of a kind Full bedding sheets will make your dorm bed your favorite place on campus!